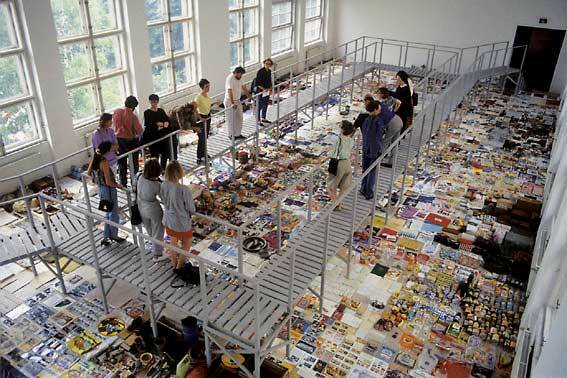 It's actually an artwork, One of Each, 1993, by Karsten Bott, as seen on Vvork. This work came to NY (PS1) in the '90s in a show called "Deep Storage." At the time of the exhibit the concept of "hoarders" wasn't in common parlance but the show featured pieces such as Warhol's time capsules (unsealed somewhat prematurely), racks of library catalog file cards, On Kawara date records in ledgers, and other obsession-compulsion-as-art projects. I couldn't name anything in Bott's collection of crap today but I remember a lot of it was old, faded and depressing. "Deep Storage" was fairly convincing about the tragedy of making, preserving, and warehousing "stuff" as an inherent flaw in gallery-style art since Duchamp. How long are you going to pay for your storage unit of found objects? There is an invisible economy in the art world based on delusion and hope, where everything eventually ends up either in permanent storage in a museum or back in the landfill. See: Paddy Johnson on Hair GIFs. Will has changed his mind about whether the mix is more important than the motion in the strange saga of animated GIFs as artistic expression. He now agrees that "The Art Happens Here" graphic from 1997 (indicating the network space among computers as the locus for "the art") has dated badly and probably shouldn't be used to symbolize the rather more sophisticated things people are doing with GIFs these days (and no, we're not talking about cinemagraphs). Oh, whoops, I don't think he said any of that--so why is he saying I'm publicly agreeing with him?